Tuesday evening's Oregon Beer Awards provided a nice lesson in what happens when big beer gets serious about making good beer. Anheuser-Busch, dba 10 Barrel, captured 10 of 75 medals awarded in 25 categories. Breakside Brewing was close behind with 9 medals. No one else was close. I suspect those involved in jumpstarting what became craft beer in Oregon are either rolling over in their graves (Fred Eckhardt, Don Younger) or shaking their heads. Because Anheuser-Busch was possibly the most significant obstacle faced by early craft brewers. For decades, AB had been drowning American palates with tasteless swill thanks to tweaked manufacturing processes and a massive distribution network. The big fellas started to mingle in craft beer during the 1990s. Deals with Redhook and Widmer helped them get their scruffy foot in the door. They couldn't figure out craft beer on their own. Attempts at making beer of substance flamed out. It worked out better to invest in craft breweries and learn from them while distributing their beer. Indeed, the foray into craft beer was largely a "wait and see" proposition. Many at Anheuser-Busch thought the craft movement would run its course and collapse. The relatively small investments they made in the likes of Redhook and Widmer were seen as insurance policies against the worst case scenario, the one in which craft beer gained a significant, lasting foothold. The worse case scenario eventually materialized, of course, which prompted AB to take the craft movement more seriously. 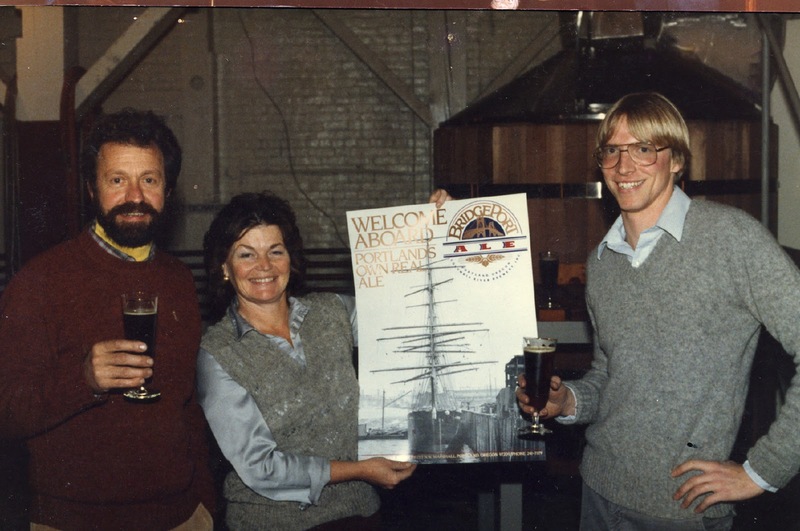 It then began purchasing craft breweries, of which Goose Island was the first in 2011, a story nicely documented in Josh Noel's book, Barrel-Aged Stout and Selling Out. 10 Barrel joined AB's collection of craft breweries when it was purchased in 2014. With Tuesday's medal take, Anheuser-Busch stepped to the forefront of craft beer in Oregon. It's a surreal development. Some may take exception to that characterization of the situation. But there is no 10 Barrel. It ceased to exist when it was bought by AB five years ago. What we have is Anheuser-Busch doing business as 10 Barrel in Oregon (and beyond). And winning medals. Anyway, congrats to everyone who won medals or received related recognition. There were nearly 1,100 entries submitted in the 25 categories, which means the chances of winning were slim. A win is a big deal in that scenario. The overall results are posted in various places. As noted, Breakside won 9 medals this year, and also was named Large Brewery of the Year. Some have joked that the Oregon Beer Awards would be more aptly called the Breakside Beer Awards. I never suggested that. But it isn't just the medals that suggest it. Breakside brewmaster Ben Edmunds runs the OBA judging competition. I've talked about this before. Everyone knows Ben. He's a good guy, has great integrity. But the optics are bad. The Oregon Beer Awards have evolved to the point where the director of competition should not also be the brewmaster at a competing brewery. It's the perception of possible impropriety that suggests the need for a change, not the existence of actual impropriety. A month or so ago, members of the Oregon Beer Awards voting academy were asked to nominate people worthy of induction into the Oregon Beer Hall of Fame. The final list of nominees appeared a few weeks later. It included Art Larrance, Fred Bowman, Kurt and Rob Widmer, Brian and Mike McMenamin, Gary Fish, Karl Ockert and several others. Around the time final votes were being collected, Jim Parker passed away following a stroke suffered in November. I knew Jim, but not well. He was a fountain of information, a character and a positive force in craft beer. I don't believe I've ever run into anyone who didn't like Jim. He touched a lot of lives in and out of craft beer. So I'm fine with Jim being inducted into the Hall of Fame. He belongs. But I do question how it was done. The decision was evidently made by small group of people, perhaps one person. The voting academy wasn't surveyed or alerted. Keep in mind that Parker, for better or worse, wasn't on the final list of nominees. It seems like this could have been handled differently. Speaking of the Hall of Fame, I continue to be shocked that virtually the entire generation of founding brewers has been passed over (John Harris is the exception). The academy vote for this year's HOF inductee hasn't been revealed, but the failure to induct our founding brewers in a timely manner is, in my view, disgraceful. I hope they don't have to die to get in. While much of the beer world is mired in flat or negative growth, there are a few big winners out there. Such is the case with pFriem Family Brewers, which just announced plans that will expand production capacity dramatically. Details of the expansion were announced at several events this past weekend in Hood River. Since they opened in 2012, pFriem has been gradually increasing the size of its leased space in the Halyard Building on the waterfront in Hood River. Finally, they had to look elsewhere. Increasing demand for pFriem beer is the reason for the expansion. That's a nice problem to have in this market, where more and more established breweries appear to be at risk. pFriem has actually been a glaring exception. Its annual Oregon production numbers show steady upward growth since it opened in 2012. The brewery produced 486 barrels that first year, barely a blip in the stats. The projected number for 2018 (the OLCC report showing the full year won't be released until March) is around 13,000. 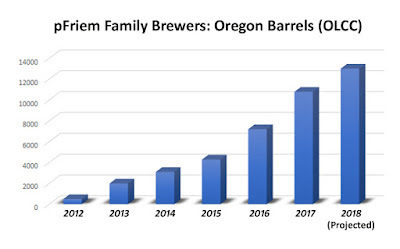 Again, we're talking about barrels produced and sold in Oregon...where pFriem sells most of its beer. Total barrelage for 2018 was nearly 19,000, a company operative told me. Over the course of the next two years, Pfriem will increase production capacity in Hood River to more than 60,000 barrels. All non-barrel aged beers will be produced and packaged there. Expansion will involve installing a second and significantly larger brewhouse, adding additional fermentation capacity and installing a canning line. A new facility down the road in Cascade Locks will provide space for them to expand and refine their barrel aging program, which has produced some award winning results, and to also consolidate warehousing and cold storage. For the past few years, pFriem has leased space in Hood River for warehousing and storage. That will go away once the Cascade Locks facility opens. Many wonder what plans pFriem has for pub expansion. The Cascade Locks facility will not have a tasting room or pub. That space will be dedicated primarily to expanding the barrel program. The good news for pFriem fans is that they are apparently considering potential pub sites, but have no imminent plans. With pFriem, these things take time. The recently activated coolship at rest. As we were finishing up Saturday evening, I had a quick conversation with Josh about the growth trajectory of pFriem. My perspective, free to be challenged, is that pFriem has done what they've done via an intense focus on across-the-board quality. They have a growing list of specialty and core beers that are well-made. The pub in Hood River always provides an excellent experience. These things do not happen by accident. A lot of people enter this industry every year. There isn't a single one of them that doesn't hope to create memorable beers and unique experiences. Only a handful succeed in doing that. Yet pFriem has done so with apparent ease. It's a fantastic, evolving success story and one that doesn't seem to involve a lot of luck. Inquiring minds are surely evaluating pFriem's success and wondering how to emulate it elsewhere. The blueprint isn't complicated. It involves an almost fanatical dedication to quality in everything they do. If you can manage that, you can emulate pFriem. So simple.